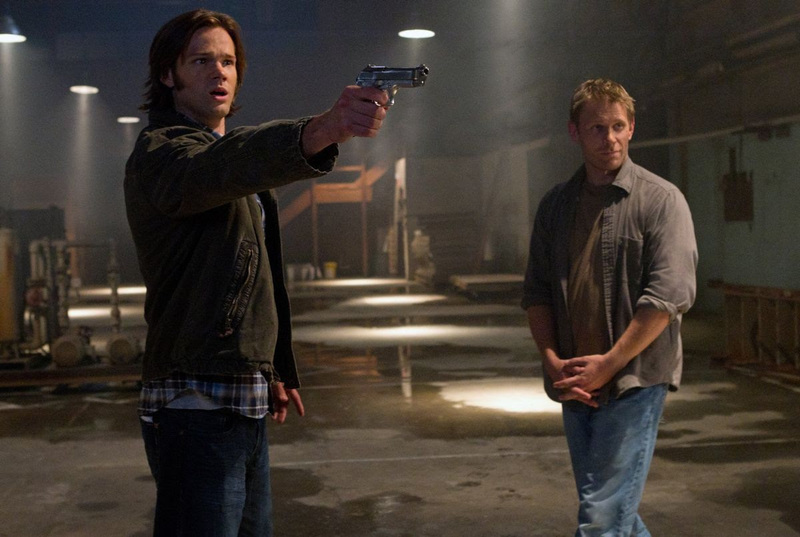 Jesse "Street Angel" Sanchez knows the pressure of being the girl who always saves the day. It’s just who she is. But when she and her friends find a powerful alien artifact, they learn that being a superhero is not all fun and games. Is this an extraterrestrial plot to destroy their middle school friendship or a gift from above that Jesse can pawn for a hot dog? This October, Eisner Award-winner Jim Rugg (The PLAIN Janes, Afrodisiac), Brian Maruca (Afrodisiac), and Image Comics present the biggest, most epic STREET ANGEL yarn yet. 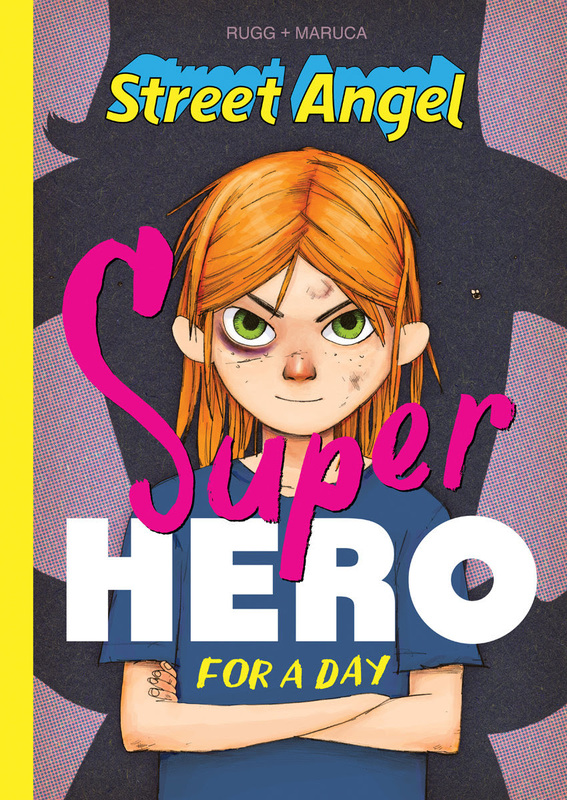 STREET ANGEL: SUPERHERO FOR A DAY, ISBN: 978-1-5343-0553-3) arrives in comic book stores Wednesday, October 25th and bookstores Tuesday, October 31st. STREET ANGEL: SUPERHERO FOR A DAY is available for preorder via Amazon, Barnes & Noble, Indiebound, and Indigo. Milestone is proud to announce that MXGP3 - The Official Motocross Videogame, released last May 30th on PlayStation®4, Xbox One and PC, will soon be available on the Nintendo Switch™. Players will be given the possibility to enjoy all the thrills of one of the most engaging and adrenaline-packed championships dedicated to the 2016 racing season wherever they are, whenever they want. MXGP3 - The Official Motocross Videogame will be the first Motocross racing title to be released on the Nintendo Switch! The game is expected to launch by the end of the year. Valiant Entertainment is proud to announce that it will be supporting Local Comic Shop Day® 2017 on November 18th, 2017 with a special, limited-edition release of the SECRET WEAPONS DELUXE EDITION OVERSIZED HC – the first oversized hardcover collection of the year’s best-selling independent limited series from Academy Award-nominated writer Eric Heisserer (ARRIVAL) and Harvey Award-nominated artists Raúl Allén (WRATH OF THE ETERNAL WARRIOR) and Patricia Martin (NINJAK) – to participating retailers! 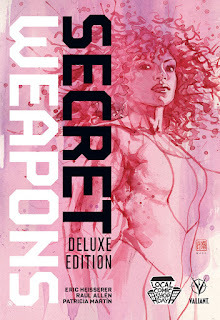 Collecting SECRET WEAPONS #1-4 with a cover by multiple Eisner Award nominee David Mack (Fight Club 2) and exclusive to Local Comic Shop Day 2017, this oversized hardcover collection of Valiant’s sold-out, critically acclaimed series will not be available for sale anywhere else, and arrives weeks before the SECRET WEAPONS TPB arrives in stores on December 13th. The SECRET WEAPONS DELUXE OVERSIZED HC will feature a beautifully presented, deluxe repackaging of the critically lauded series, and feature more than 20 pages of bonus material including character designs, process art, and more that won’t be found anywhere else! Eric Heisserer – the Academy Award-nominated screenwriter of ARRIVAL and Valiant’s upcoming BLOODSHOT and HARBINGER feature films – joins forces with Harvey Award-nominated visionary Raúl Allén (WRATH OF THE ETERNAL WARRIOR) here for an all-new Valiant adventure... launching Livewire and an extraordinary new team of heroes into the fight of their lives! Local Comic Shop Day® shines a bright spotlight on locally owned independent comic book specialty stores and their role in shaping the pop culture market. This year, Local Comic Shop Day® will be Saturday, November 18th, the Saturday before Thanksgiving. On Local Comic Shop Day®, participating retailers will have exclusive, and in some cases, limited items debuting from supporting publishers. The goal of Local Comic Shop Day® is to jump start the holiday buying season for storefront comics specialty retailers by giving comics fans more of what they most desire. Valiant’s NINJA-K #1-5 Pre-Order Bundle Expands to Five Action-Packed Issues! 2017’s Explosive New Series Adds All-New Origin Issue from Christos Gage & Juan Jose Ryp – Featuring the Debut of NINJA-G! pre-order bundle is getting even bigger! Originally solicited with four specially expanded, 40-page issues, Valiant can now reveal that NINJA-K #1-5 PRE-ORDER EDITION BUNDLE has grown to include a previously unannounced fifth issue, February’s NINJA-K #4, that will include the origin and first appearance of Colin King’s lethal predecessor in the Ninja Programme – NINJA-G – as told by red-hot writer Christos Gage (Amazing Spider-Man) and blockbuster artist Juan Jose Ryp (BRITANNIA)! 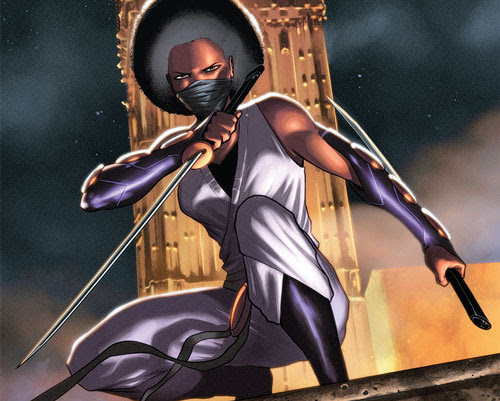 At the height of 1970s Britain, MI-6’s covert Ninja Programme has just activated its first female agent: NINJA-G! As a financial crisis grips the nation and anarchy brews in the streets, can MI-6’s newest ninja recruit counter a steady tide of the double agents, double crosses, and dueling nation states that will take her from the leather-padded corridors of London to the most severe corners of the Soviet Bloc? The life expectancy of a ninja agent is never long…but just how and why are NINJA-G’s missions still impacting Ninjak’s deadly manhunt in the modern day? And could her legacy hold the secret to decoding the murders of the Ninja Programme’s last surviving members – before Colin King is scratched off the list once and for all? Available only as a pre-order set to fans who reserve the first five issues of the EXPLOSIVE NEW ONGOING SERIES from acclaimed writer Christos Gage (Netflix’s Daredevil) and Valiant superstar Tomas Giorello (X-O MANOWAR), the NINJA-K #1-5 PRE-ORDER EDITION BUNDLE kicks off with a jam-packed 48-page debut and exclusive covers by Eisner Award-nominated artist Tonci Zonjic (Who is Jake Ellis?, Immortal Iron Fist) on each issue – all specifically reserved for fans who pre-order with their local comic shop by the initial order date (IOD) of September 28th, 2017! Packed with the same trade paperback-style extras and bonus content – including creator commentary, behind– the-scenes looks at the creation of the comics, process character designs and artwork, and first looks at upcoming issues – this pre-order edition will not be offered past the initial order date of September 28th, 2017! Released monthly from November 2017 through March 2018, each PRE-ORDER EDITION comes packed with trade paperback-style extras and bonus content, including creator commentary, behind–the-scenes looks at the creation of the comics, process character designs and artwork, and first looks at upcoming issues – plus an exclusive cover by renowned artist Tonci Zonjic that can’t be found anywhere else! It all starts here on November 15th as renowned writer Christos Gage (Netflix’s Daredevil) and Valiant’s latest superstar artist, Tomas Giorello (X-O MANOWAR), present a stunningly precise jumping-on point leading Ninjak on a manhunt through a cold, calculating world of espionage and international intrigue in search of a killer targeting all “ninja” agents – past and present! For nearly a century, MI-6, the most elite branch of Britain’s clandestine intelligence service, has honed a ruthlessly effective, top-secret division – THE NINJA PROGRAMME – into one of its nation’s most finely wielded weapons. Tasked as the first and last line of defense for queen and country, this small shadow army of agents and assassins has produced a succession of notable assets, including NINJA-A, the Queen’s silent weapon of World War I; NINJA-E, the globe-trotting secret agent that pulled the Cold War back from the brink of Armageddon; and, most recently, NINJA-K, aka Colin King, a brash but fearless instrument of lethality that has saved the world from madmen and terror at every turn. Then: This February, red-hot writer Christos Gage (Avengers: The Initiative) and blockbuster artist Juan Jose Ryp (HARBINGER RENEGADE) present a standalone interlude with seismic ramifications for the Ninja Programme’s past and future as NINJA-G steps to the fore for a martial arts melee in the heart of 1970s London, only in NINJA-K #4 – now an essential addition to the NINJA-K #1-5 PRE-ORDER EDITION BUNDLE! Colin King’s new assignment begins on November 15th, only in NINJA-K #1 – featuring covers by Trevor Hairsine (DIVINITY), rising star Lucas Troya, Kenneth Rocafort (The Ultimates), David Mack (Kabuki), and Mico Suayan (BLOODSHOT SALVATION)! 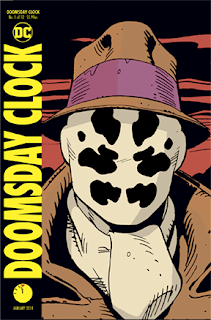 THE NEW DOOMSDAY CLOCK #1 LENTICULAR REVEALED! Writer and DC President and Chief Creative Officer Geoff Johns has revealed the final cover for DOOMSDAY CLOCK #1! The lenticular cover features prior existing WATCHMEN art by Dave Gibbons, and is the final version to what was revealed last week, along with the main cover and variant from artist Gary Frank. DOOMSDAY CLOCK #1 will hit shelves November 22, with more details on the way in the coming months! DC Comics presents to a 12-issue maxiseries from the critically acclaimed team of writer Geoff Johns, artist Gary Frank, and colorist Brad Anderson. You are not prepared for what lies ahead within these pages, good readers.